As Christmas draws ever nearer I’m trying to pick crafts that can be used to make presents or decorations. This week’s craft falls into the first category: fabric painting. It’s a really simple craft to do – you just need some paints, a brush and something to paint (oh and an iron but I’m hoping you already have one of those unless you like the slept-in-my-clothes look). I decided to paint some canvas tote bags. Despite loving crafting I am a little artistically challenged on the painting front (and yet, two weeks in a row I’m doing crafts involving painting!) so I kept it simple with circles. I drew them first using a fabric pen and then filled in the shapes with gold and brown paint. 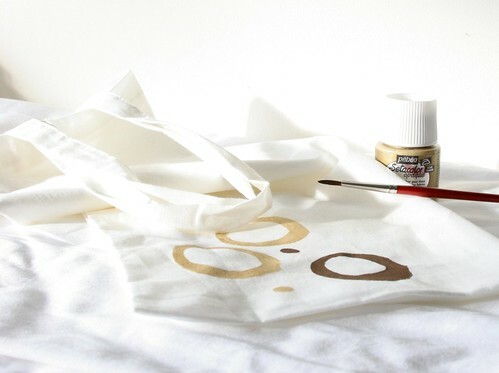 A couple of tips – if you’re painting something like a bag or t-shirt that has two layers of fabric make sure you put some paper inside to protect the other layer; and of course make sure you protect the table you’re working on. Once the paint is dried you just iron it to set the design – follow the instructions on your paints. I only had time to paint one bag this week but time marches on and week 26 is just around the corner – I think I need a whole weekend of crafting to have time to finish all the projects I’ve started and keep up with my weekly challenge. I like this idea! Are you using specific fabric paint or just acrylic paint? Probably a silly question but wanted to be sure. I love tote bags so I like your idea and they would make great gifts. Keep up the good work.